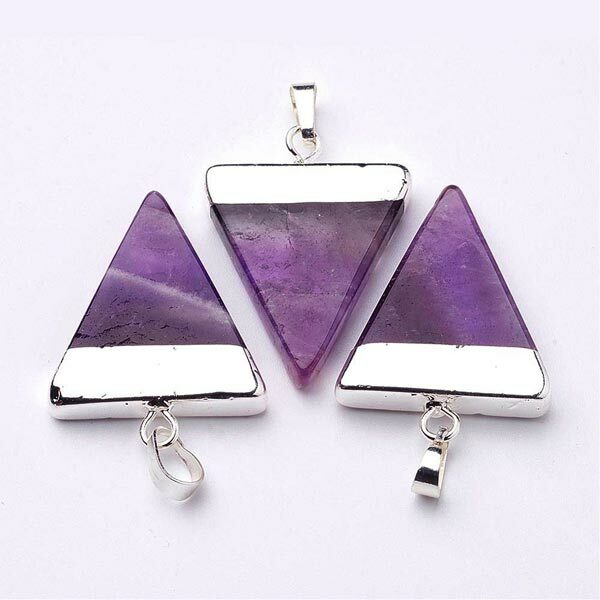 Triangle Shaped Natural Amethyst Pendants, with silver electroplated mounting. Bail is 8mm x 5mm, large enough to accommodate chain or cord. Stabilizes the connection of soul and body and spiritual with physical levels. Manifests spiritual awareness in daily life and spirituality as a way of living. Aids in your understanding the wheel of life, death and rebirth of self as part of the universe and universal whole. Aids alcohol and drug recovery, alleviates headaches, relieves stress and gives inner peace. Amethyst has a Trigonal crystal system and is in the mineral class of oxides, the quartz group. It belongs to the group of crystal quartz that form large, visible crystals. It's beautiful color comes from the traces of iron that are lodged between the layers of its structure. 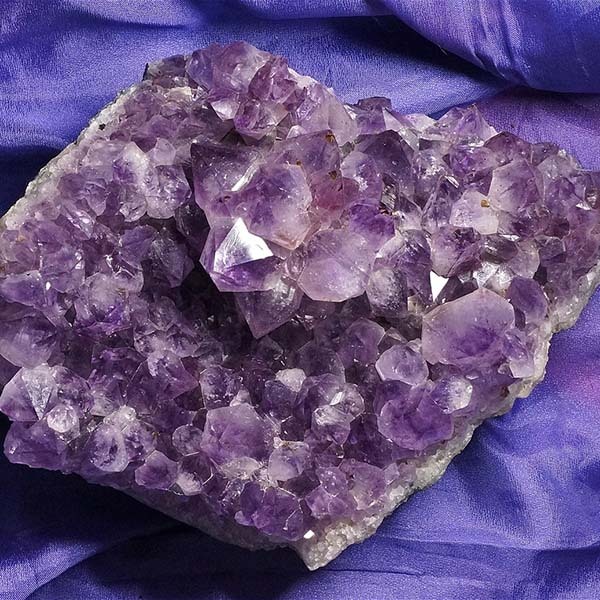 Amethyst is formed hydrothermally, mainly in hollows that have been formed by gas bubbles in volcanic rock. It is also formed more rarely in rock clefts and rocks with channels running through them. A hollow that is lined on the inside with Amethyst crystals is called an Amethyst Druse (which is large) or an Amethyst geode (which is small). 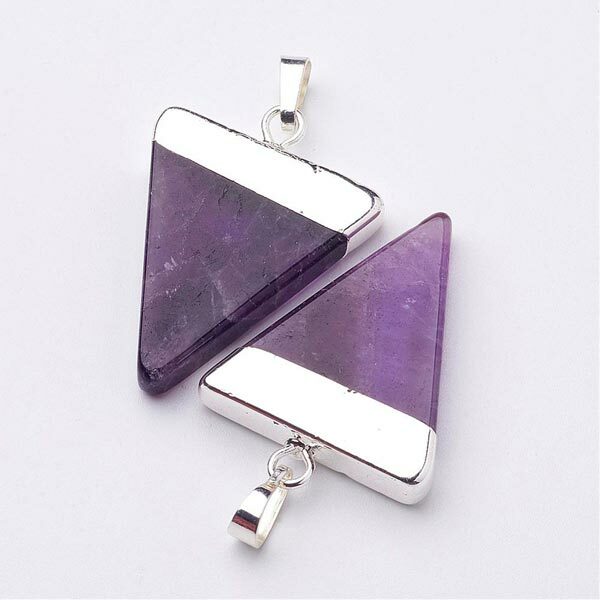 Amethyst is best worn as some type of pendant next to the body or used as a crystal held during meditations. It will strengthen intuition by centering the mind to be aware of answers rising to your consciousness. Amethyst encourages spiritual wakefulness. It holds a sense of justice and provokes honesty. Used in meditation it helps to quiet the mind and is an aid to finding inner peace and discovering our own wisdom inside. Amethyst will help you in dealing with sadness or grief and support you in coming to terms with loss. It clarifies your inner world of images and dreams. If you sleep with a crystal under your pillow, your dreams will be stimulated until all undigested images have been cleared. After a few days your sleep will become calmer and deeper and you will awaken much more refreshed. Worn while awake, Amethyst stimulates inspiration and intuition. Amethyst encourages sobriety (clear thinking) and awareness. It assists in facing up to all experiences, good or bad, and encourages dealing with our perceptions. In gaining this higher perspective, we can overcome blocks, uncontrolled thoughts and addictive behavior. Amethyst helps rid pain or tension and is especially helpful with tension headaches. It also helps with illnesses that arise from nervous complaints, the lungs and respiratory tract, skin blemishes and intestinal complaints. Amethyst has special affinities with Aquarius, Pices, and Aries. It is recommended for dancers, gardeners and professors. Its Energy is Receptive, Planets are Jupiter and Neptune, and its Element is Water. In French literature it is written that Bacchus had been offended and was determined to avenge himself. He declared that the next person his train came across should be devoured by his tigers. As fate would have it, this luckless mortal was a beautiful maiden named Amethyst who was on her way to worship at the shrine of Diana. As the tigers charged towards her, Amethyst sought the protection of the goddess. She was saved by changing shape into a pure white stone. Bacchus recognized this miracle and repented his cruelty by pouring the juice of the grape over the petrified body of the maiden and so giving the stone its violet hue.